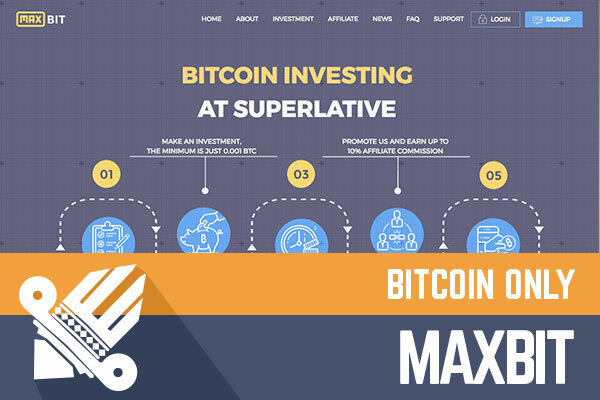 I have just opened a website of latest HYIP called MaxBit, which has joined DavidNews.com Sticky Listing only two days ago. What a coincidence that this is a second HYIP this week that accepts only Bitcoin. The program has been online for 3 days and I have reinvested in MaxBit $360, to keep an eye on the performance of it. At first glance, nothing unusual about it. However, let’s take a closer look and find out more about the newbie to the HYIP world. After a quick read, I realized that there is more than one coincidence. In fact, this is the second HYIP I have reviewed lately, which provides an extra feature for the modern world, which often is in the hurry. What is it? The increase of deposit is updated once in an hour. In the previous review, we had a program with refreshing time once in a minute. Even though these frequent updates don’t mean the HYIP is offering much higher interest rates than programs with daily updates, I prefer seeing hourly updates because they are less annoying and I will not end up watching my screen like in a casino. These frequent updates are something that helps stand out of the crowd and are convenient for some people. However, I paid attention to it because lately there were only programs on DavidNews, which had a daily profit updates. We have here another HYIP with homework done. MaxBit admin has registered the company for this program and has registration certificate place right on the homepage. For those who are new to this industry, company registration is just one of the credibility factors, which in fact doesn’t guarantee that a HYIP will be a long-term success for investors. However, it requires some extra effort to contact Companies House and do the registration. Where is the company located? In London, like many other HYIP’s lately. If you are in London, drop by and tell them hello. Please also drop a message in a chat box and let us know if there was anybody in the office. The website is simple yet functional. I like such websites, where owners are not flooding me with words and get to the point right on the home page. However, my brain has not developed yet an algorithm for calculating bitcoins from USD and vice versa. Therefore, it took me a few seconds to understand min and max deposits for each investment plan. We will get to it later, but I would prefer good old uncle Sam, which makes it easier for the average guy. Sure, why bother mentioning uncle if the HYIP accepts only Bitcoins. Besides, there are plenty of Bitcoin calculators online and you can use one of them. In terms of MaxBit legend, there are no surprises about the company. It’s totally into cryptocurrencies. They accept only Bitcoins and claim that revenue for our interest rates is earned in the cryptocurrency industry (Bitcoin & other new age currencies) by their skilled traders. Hopefully, they know what they are doing. However, remember anything can be written on a HYIP bio pages, to convince you and build trust in them. As I mentioned before, I prefer uncle Sam and will stick to it in this paragraph about the interest rates. Moreover, those who know Bitcoin exchange rate by heart, it will be no problem and vice versa. MaxBit is offering 3 different investment plans based on the deposit. Sure, the higher deposit the higher interest rate. They vary from 3.36% to 4.8% daily. All investment plans have an unlimited term. Initial deposit is not kept and can be withdrawn, but it takes 3 days’ time and the investor will be charged 5% cancellation fee. In fact, it’s same as it was for the HYIP in the previous review. The minimum deposit in the first plan is around $2. As usually, most important is daily revenue for me. For example, investment of $200 would be an investment in the first plan with 0,14% hourly and 3,36% daily. This amount of money would make around $6.72 a day and around 134.4 a week. Keep in mind the cancellation fee as well. As usually, keep in mind that there is no psychic in the world that would predict how long will the HYIP live. 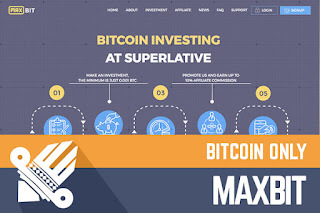 After all, MaxBit is another HYIP with frequent revenue updates, which is accepting exclusively Bitcoins. As I wrote earlier, the second program in the row with a similar approach for a fast-moving World. Valid company registration details with an entry in Companies House website. Simple, yet functional website with all the most important information out there. Nothing much to add in this regard. As usually, it’s totally up to you how to use this information gathered in this review. The program is very new and I would kindly ask you to share any information in the chat box in case you notice anything unusual about it. In the meanwhile, always keep in mind that all HYIP’s are highly risky and you are the only person responsible for your investments. Therefore, if you ever decide to make any investments, don’t invest more than you can afford to lose! Investment plans: 0.14% hourly (3.36% daily) up to 0.2% hourly (4.8% daily) for an unlimited term. Possibility to withdraw your initial deposit anytime after three days with 5% cancelation fee.